The magnetostrictive sensor (MsS) probe uses the magnetostrictive effect to generate and detect guided wave in pipe. The magnetostrictive effect is a small change in the physical dimension of ferromagnetic material caused by an externally applied magnetic field. The MsS probe applies a time-varying magnetic field to the ferromagnetic material for guided-wave generation and picks up magnetic induction changes in the material caused by the propagating guided wave for guided wave receiving. The most common application of MsS technology uses a ferromagnetic strip material. The guided wave is generated in the ferromagnetic strip and coupled to the structure through epoxy bonding (in inspection and monitoring application) and dry coupling by pressure (in inspection application). Examples are longitudinal and torsional mode probes in pipe and tube inspection, symmetric and asymmetric Lamb wave probe and shear-horizontal mode probes in plate or sheet, and longitudinal mode probe in nonferrous anchor rod. In some applications, MsS probes are directly operable on structures made of ferrous materials such as carbon steel or alloyed steel. Examples of direct operation are ultrasonic longitudinal mode inspection in pipe, tube, anchor rod, and bridge cable. 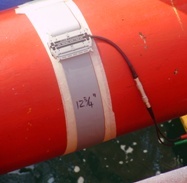 In the common setup for pipeline inspection, MsS probes consist of ferromagnetic strips (0.15 mm thick) and ribbon cables (less than 4 mm thick) as shown in the figure. The thin probes can be applied to a pipe having 25-mm or higher clearance between pipes. The MsS probe continuously covers the whole circumference (360°) of pipe so that MsS-generated guided wave has a short deadzone and minimizes flexural mode generation. Thus, MsS probe allows inspection of up to 500 feet in each direction in aboveground painted pipes of good condition with a defect detection sensitivity for defects that have an area of approximately 2-3% of the total pipe wall cross section. Furthermore, the inexpensive MsS probes are most often permanently installed to pipeline at difficult-to-access location to facilitate long-term pipeline monitoring.